Perfume allergies are caused by the fragrances used to make the perfume. If you have a perfume allergy, you are very likely to have fragrance allergies. Perfumes are made up of a mixture of different fragrances. These mixtures create the different scents of each perfume. Between 10 and 300 different fragrance are used in each product. There are up to 2500 different fragrances used. Though only around 100 of these are known allergens. Reports have shown that of those 100, around 25 are used frequently. Around 10 of these are used very frequently. The fragrances used are found not only in perfume. They are also used in any fragranced products. Anyone can develop perfume allergies. Though they seem to be more common in women. This is likely because most of the products that contain fragrance are more often used by women. Though the use of men's products is increasing. This is more than likely to mean that an increased number of men will see an allergy developing. 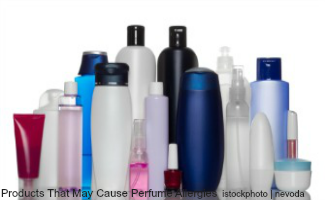 Someone with eczema is more susceptible to alot of allergies, including perfume allergies. This is because the damage to the skin makes it easier for an allergen to enter the skin. 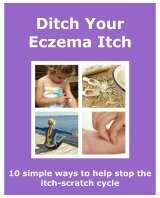 This causes skin irritation, making the eczema symptoms worse. One of the areas of the body that is prone to perfume allergies is our armpits. Most deodorants contain some sort of fragrance. It can be natural or chemical. Deodorants are put directly on your skin, and left all day. This can increase the chance of an allergy occurring. There are so many different types of products that contain perfume. An allergic reaction could appear anywhere on the body. If you notice a new rash appear it can help to keep a diary of any products you have used. Especially if you have started to use a new product. If you can pinpoint the rash to one product, that is half the battle. The next thing to do is to work out which fragrance/s in the product is causing the reaction. This can be quite difficult as some products have many different ingredients. Some of them could be potential allergens. 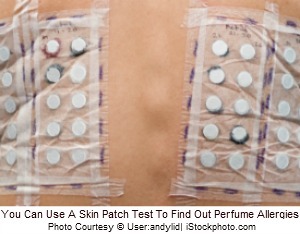 One way to find out what fragrances you could be allergic to is to do a skin patch test. This would be done by a dermatologist. These fragrances are found in all sorts of products, used in Europe and the USA. A good way of limiting the damage that can be done by perfume allergies, is to avoid using them, and limiting contact with them. This can be tricky. Even if a product says that it is perfume free or hypo-allergenic, it may still contain a small amount of fragrance. You can try and reduce the amount of time a product may have contact with your skin. It is also best to avoid cosmetic items that have to be left on your skin, like face creams. If you have a new cream or lotion that you would like to try, you can test it on a small area of skin first. Choose an area of skin that is out of sight. If there is no reaction after 48 hours the product should be safe to use. But that is not to say that a reaction wont happen in the future. Sometimes an allergy takes time to develop. In Europe, as of March 2005, there is a legislation that requires cosmetic products containing certain ingredients, to show them on their label. If a product is one that is left on the skin, it will contain 10 ppm (parts per million) or 0.001% or more of an ingredient. If a product is one that is rinsed off, it will contain 100 ppm or 0.01% or more of an ingredient in it. There are 26 ingredients that this legislation applies to. It is important to remember that just because one of these ingredients is not listed in the ingredients of a product, it may still contain it. There could still be a small amount of the fragrance in the product. It could still be enough to cause a reaction if you are ultra sensitive. The best way to find out if a product contains fragrance, is to smell it. If it smells nice it will more than likely contain a fragrance. If a rash appears after use, then stop using the product immediately. Keep hold of the container and packaging. This is so you have a list of ingredients. This can help you to narrow down some of your suspected allergens. If the rash gets worse or doesn’t clear up then visit your doctor. The good news if you have perfume allergies is that you wont be allergic to all fragrances. So you wont get a reaction from all perfumed products. It may take a little bit of time to work out what products you should avoid. But it will also help you to work out what ones you can use. So you don’t have to avoid all those nice smelling toiletries. I am allergic to perfume. I personally decided, when I started buying my own toiletries, that I would try and avoid heavenly scented products. I found a lot of cheap toiletries contained a lot of chemicals. If I used a certain product and my eczema flared up I would stop using it. And then add it to my list of products not to buy again. I have never worn perfume. I would never try to wear it. When I walk through the perfume department of a large store, my skin tightens up and feels very itchy. I think it would take me quite a while, and quite a few flare ups to find a brand that might not affect my skin. You might decide that it is worth the effort. Or you could get a skin patch test done to find out which fragrance/s are a problem for you. This could help you eliminate some brands. For me I haven’t worn perfume for 40 years, so I don’t miss it. One of the products, that in the past, I have found difficult to find a suitable brand, is deodorant. Even if they say they are hypo-allergenic they can still cause a problem. I have found that using one without alcohol works best for me. My skin definitely reacts more to something when it is left on my skin. I don’t use cosmetic creams or lotions. I use an emollient as a cleanser and moisturiser. There are so many different products you can try. There is a high chance that there will be as least one you can use, without a flare up occurring from your perfume allergies. If you know which fragrance/s affect you, then that makes it easier for you. So try by the process of elimination to work out from the ingredients of products you have used, which ones might be a problem. Or you could ask your doctor or dermatologist about getting a skin patch test done. You don’t have to live without your nice smelling toiletries. You just need to take a bit of time to work out which ones are best for your skin.